Σχεδιασμένο για ταξίδια τόσο επαγγελματικά όσο και διασκέδασης, το Sleepbox Sukhumvit 22 Hostel είναι ιδανικά τοποθετημένο στη Σουκχαμβιτ, μια από τις διασημότερες περιοχές της πόλης. Από εδώ, οι επισκέπτες μπορούν να έχουν άμεση πρόσβαση σε όλα όσα η πόλη έχει να προσφέρει. Από τη βολική της τοποθεσία, η ιδιοκτησία προσφέρει εύκολη πρόσβαση σε κορυφαίους προορισμούς της πόλης. Με τις υψηλού επιπέδου υπηρεσίες και την μεγάλη ποικιλία ανέσεων, το Sleepbox Sukhumvit 22 Hostel δεσμεύεται ότι η διαμονή σας θα είναι όσο πιο άνετη γίνεται. Η ιδιοκτησία παρέχει δωρεάν WiFi σε όλα τα δωμάτια, 24ωρη φύλαξη, ημερήσιος καθαρισμός, 24ωρη ρεσεψιόν, φύλαξη αποσκευών, φροντίζοντας για τη μέγιστη δυνατή άνεση των επισκεπτών. Το Sleepbox Sukhumvit 22 Hostel διαθέτει 45 δωμάτια. Όλα τους είναι διακοσμημένα με γούστο και πολλά από αυτά παρέχουν ανέσεις όπως επίπεδη τηλεόραση, επιπλέον μπάνιο, επιπλέον τουαλέτα, τάμπλετ δωματίου, λευκά είδη. Το ξενοδοχείο προσφέρει φανταστικές εγκαταστάσεις, συμπεριλαμβανομένων των πινγκ-πονγκ, για να σας βοηθήσουν να χαλαρώσετε μετά από μια γεμάτη δράση μέρα στην πόλη. Όταν ψάχνετε για ένα άνετο και βολικό μέρος για να μείνετε στη Μπανγκόκ,το Sleepbox Sukhumvit 22 Hostel γίνεται το σπίτι σας μακριά από το σπίτι σας. Προσφέρεται πρωινό χωρίς πρόσθετη χρέωση για τους επισκέπτες. Parking [charges apply] is limited and is on a first come, first served basis. The location was pretty much outside and deserted. Also the staff was not very joyful or helpful. There was no proper breakfast there and wwant ready as well at 8 am. The rooms were good and clean though. Apart from the thin walls, which is understandable given that the design is cargo container, everything is perfect. We were surprise at how the wonderful the hostel is. The Best part is that although it is a hostel children are welcome. This will be our go to hotel in bangkok if we are on a budget. I stayed in a female 4 beds dorm for a few nights, and I'm very impressed with the size of the bed and quality of mattress but for the fact that I requested a quiet room - I got the room just above the reception /garage which I basically hear everything from staffs chatting and vehicle sounds. It would have been better if the quiet room was on a higher floor away from noises and the shower and toilet facilities should be completely separated. Otherwise I had an enjoyable stay, it's very convenient to commute wherever I needed to go and a convenient store is just round the corner. Near mrt and bts around sukhumvit and parks. The location of the hostel is considered far from city center and the public transport is about 15mins away by walking. You may wish to take the motorcycle taxi, which cost you 20 baht to the nearest subway/metro. However, if you are wishing to take taxi or Grab, the traffic is so terrible. It is a residential area, so very limited of available restaurants and pubs or sightseeing around the vicinity. The hostel is unique and services rendered were satisfied. But in terms of conveniece, Im reserved. 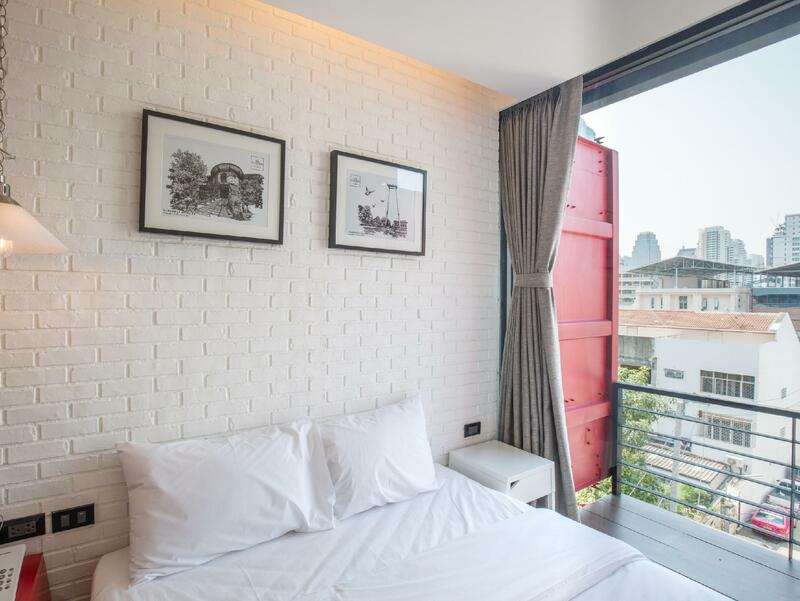 It's a nice hostel in sukhumvit area, you can barely walk to the mall in 10 minutes. beside the room is clean and nice. the staff helps me and my friend so much to order a grab taxi. Will recommended this hostel to others. thank you for your review we hope to see you again next time have a good day! Pros: lovely decorations, private toilet and shower for my group 4 peoples, comfortable beds. Free toast and coffee in the morning (love it). Near 7/11 so convenient for buy food and drinks at night. Cons: - A little far from BTS prom phong and there's no shutters from hostel to BTS so you should walk around 15-20 minute, with the hot weather in Bangkok so you got wet when come to BTS, so sometimes we take a taxi the price around 40 bath/1 way it okay. - There's no toothbrush, the shower crean and shampoo look a little scare so we buy it from 7/11. Clean and awesome housekeeping service help us clean up everyday. Safe and convenient. Comfortable space especially the common room where everyone chill out there and eat Thai street food. Best memories, Thanks! The WiFi in room was terrible, which make us felt trap in room. Very nice place to crash. Towel provided, good locker. Hot shower. A place to hang your wet gym clothes outside to dry. Free toast in the morning. Great. A well designed hotel, operated by young friendly staffs, and is considered big in Sukhumvit where everything are just so cramped. There's a shared kitchen, you can have nice coffee and toast and even cook yourself. You need a 15-30 mins walk to nearest BTS station Phrom Phong, but it's ok, Sukhumvit 22 is such a happening place anyway. We stayed in one of the private rooms. 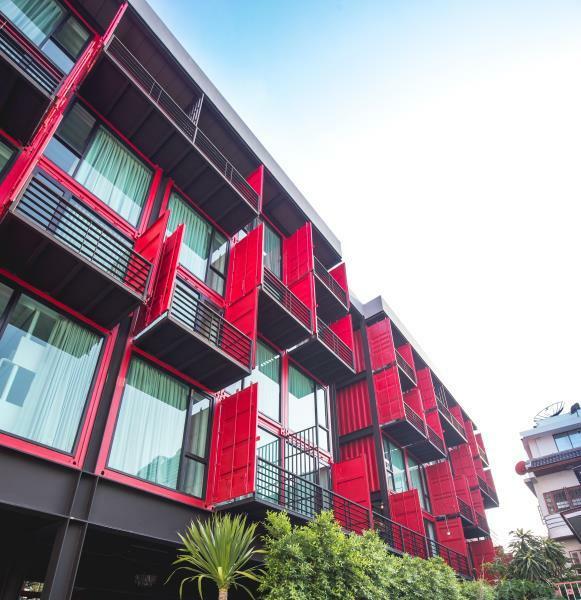 The entire building is constructed from recycled shipping containers, and looks very cool and funky both inside and out. Unfortunately squirrels / rats / birds walking on the roof make quite a lot of noise, so you might have ot get used to the pitter patter of tiny feet above your head. Location is great, although it's a little bit of a walk down Sukhumvit 22 it's in a quiet-ish backstreet. Staff were great, helpful and friendly and loved playing with our baby. Helped us organise Motorbike taxis and regular taxis to the Airport, all with no surcharge and no hassles. All in all, it's a great budget option in Bangkok. Close to good street food, places like Emporium etc. There is a hotel tuktuk to the BTS, but it seemed to run very infrequently (and never when we were wanting to go). Motorcycle up Sukhumvit 22 is only 20 THB though. 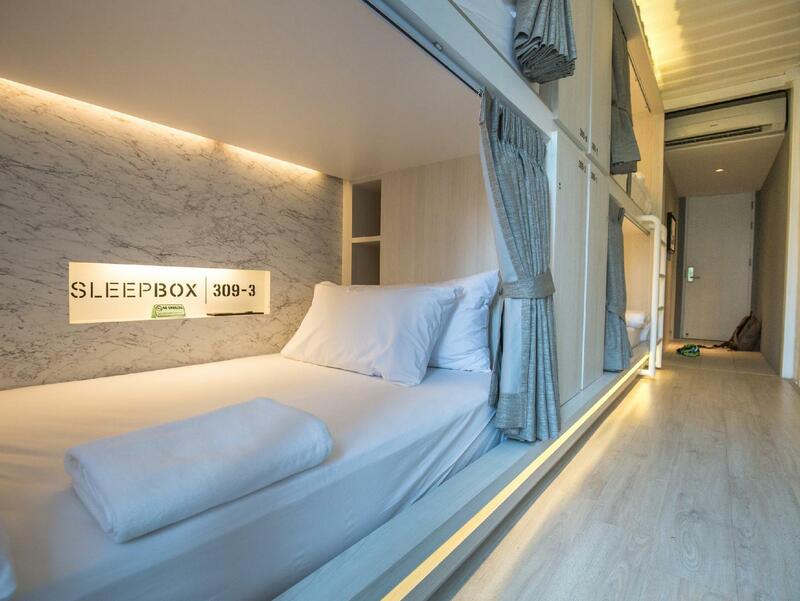 Sleepbox has a very nice decoration and interior in the lobby. But going up to our room, double room with ensuited bathroom, the interior was not as pretty as its lobby. But it's ok. The floor was bit dirty but tolerable for us. Going out to BTS, you can find many bars open at night. Well not much street food stall that we found. Convenience store is just 1-2 mins walking from hotel, which is good! There's shared kitchen that you can use, pretty nice. But i didn't find any pingpong or table tennis as it's stated in the facility, while it is listed down in Sleepbox page at agoda. only downside are the location and unreliable wifi (better to opt for a traveler sim) but overall experience is great. friendly staff, clean rooms, private bathrooms, nice over all concept, near 711 and other convenience stores. 24 hour check-in is very convenient. It's a designed hostel, every equipment is perfectly maintained. Private dorm with toilet and shower room is good for small travel group, but I advise you can set a sink inside the toilet. The entrance of the ally is very smelly, not only the rubbish, but also urine. Hope you improve and get better. It was about a km away from the nearest station but grabbing a taxi around the area was easy. Each bed had its own electrical sockets and light which was very convenient especially for group travelers. Efficient use of space. Great hostel. Fairly new. We will stay at this hotel very often. We can use the bathroom (toilet and shower room separately). Clean room and free breakfast. 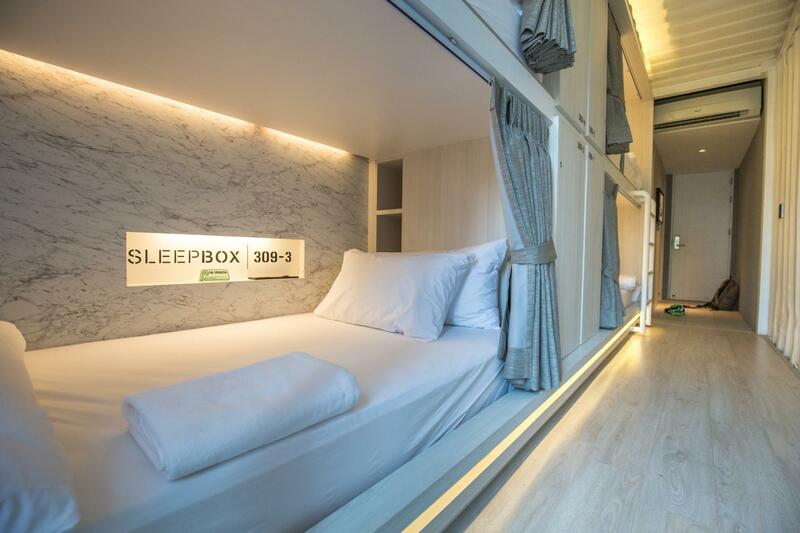 The sleeping box is a nice hotel. We (2-3 people) always select "private dormitory". However, wifi is slow in the room. That is really inconvenient! I really want them to improve their Wifi system. And I want them to have more hair dryers. We had a very pleasant stay here in this hotel with my sisters for 3 days. Staff are very helpful and always happy to help. Mr Nhong (one of receptionist) offered us a great help with lots of information, and free Tuk-Tuk ride from hotel to nearest BTS station. (around 1.5km) Also you can use share kitchen with boiled water and other equipment to cook breakfast in the morning, and you can use washing machine (40Bath~1,1USD) each time you use. Cleanliness is a plus for this new hotel. Location is not very near to BTS Station but if you dont want to walk under hot weather, you can take a motorbike taxi or Tuk-Tuk to the nearest station and it wont cost much. Definitely will recommend my friends to visit here. Σταθμός MRT Queen Sirikit National Convention Centre στα 0.5 χλμ.